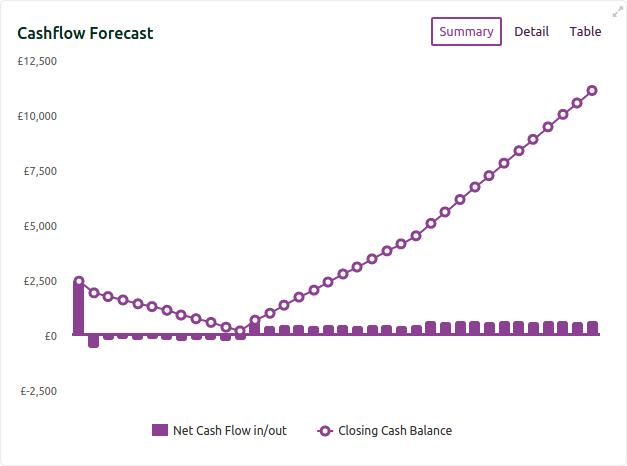 Business Forecasts made Simple, Easy and Painless. Visualise the future. Will your business be profitable, or a dead weight? What if you changed your prices - or didn't meet your sales forecast? Better-informed decisions mean a stronger business. No spreadsheets, no calculations, no endless march of next > next > next. Just a simple, intuitive interface wrapping a powerful and flexible financial engine that tells you how the numbers will stack up. 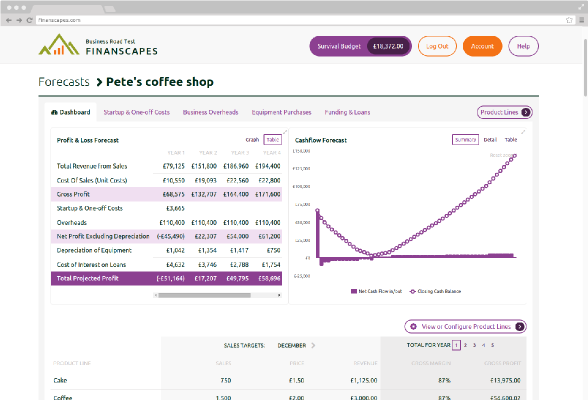 Finanscapes is the simplest, easiest way to forecast your profitability and cash flow. Why is Forecasting So Valuable? Cash flow problems kill businesses - even if they are profitable. Wouldn't you like to know in advance, so you can take the right action rather than stumble into stress and worry? Forecasting is cheap. Failing is expensive. Model your business and your ideas before you take action. Better-informed decisions mean stronger businesses. Modelling scenarios is quick and easy but you can only take your business down one path at a time. Wouldn't you like to know which ones are profitable without having to try each one out? A powerful, intuitive and beautifully simple interface. As you enter your information we build your profit and cash flow forecast, protected from formula errors and mistakes. Insightful graphs and performance indicators that show you the future and tell you how your business will shape-up. Unlimited plans and scenarios, letting you model different ideas and scenarios to help you decide what to do. Accurate, professional financial forecasts in a standard format for investor and lender review. Make their job easier while raising your credibility.